The thing to bear in mind is that the White House does not do investigations. Not criminal investigations, not intelligence investigations. Why is that so important in the context of explosive revelations that Susan Rice, President Obama’s national-security adviser, confidant, and chief dissembler, called for the “unmasking” of Trump campaign and transition officials whose identities and communications were captured in the collection of U.S. intelligence on foreign targets? Because we’ve been told for weeks that any unmasking of people in Trump’s circle that may have occurred had two innocent explanations: (1) the FBI’s investigation of Russian meddling in the election and (2) the need to know, for purposes of understanding the communications of foreign intelligence targets, the identities of Americans incidentally intercepted or mentioned. The unmasking, Obama apologists insist, had nothing to do with targeting Trump or his people. In general, it is the FBI that conducts investigations that bear on American citizens suspected of committing crimes or of acting as agents of foreign powers. In the matter of alleged Russian meddling, the investigative camp also includes the CIA and the NSA. All three agencies conducted a probe and issued a joint report in January. That was after Obama, despite having previously acknowledged that the Russian activity was inconsequential, suddenly made a great show of ordering an inquiry and issuing sanctions. The FBI, CIA, and NSA generate or collect the intelligence in, essentially, three ways: conducting surveillance on suspected agents of foreign powers under the Foreign Intelligence Surveillance Act (FISA), and carrying out more-sweeping collections under two other authorities — a different provision of FISA, and a Reagan-era executive order that has been amended several times over the ensuing decades, EO 12,333. As Director Comey explained, in answering questions posed by Representative Trey Gowdy (R., S.C.), those three agencies do collection, investigation, and analysis. In general, they handle any necessary unmasking — which, due to the aforementioned privacy obsessiveness, is extremely rare. Unlike Democratic-party operatives whose obsession is vanquishing Republicans, the three agencies have to be concerned about the privacy rights of Americans. If they’re not, their legal authority to collect the intelligence — a vital national-security power — could be severely curtailed when it periodically comes up for review by Congress, as it will later this year. Those three collecting agencies — FBI, CIA, and NSA — must be distinguished from other components of the government, such as the White House. Those other components, Comey elaborated, “are consumers of our products.” That is, they do not collect raw intelligence and refine it into useful reports — i.e., reports that balance informational value and required privacy protections. They read those reports and make policy recommendations based on them. White House staffers are not supposed to be in the business of controlling the content of the reports; they merely act on the reports. Of course, the consumer doing the asking in this case was not just any government official. We’re talking about Susan Rice. This was Obama’s right hand doing the asking. If she made an unmasking “request,” do you suppose anyone at the FBI, CIA, or NSA was going to say no? That brings us to three interesting points. It appears very likely that Susan Rice was involved in the unmasking of Michael Flynn. Was she also monitoring the FBI’s investigation? Was she involved in the administration’s consideration of (bogus) criminal charges against Flynn? With the subsequent decision to have the FBI interrogate Flynn (or “grill” him, as the Times put it)? The second point is that, while not a pillar of rectitude, Ms. Rice is not an idiot. Besides being shrewd, she was a highly involved, highly informed consumer of intelligence, and a key Obama political collaborator. Unlike the casual reader, she would have known who the Trump-team players were without needing to have their identities unmasked. Do you really think her purpose in demanding that names be revealed was to enhance her understanding of intelligence about the activities and intentions of foreign targets? Seriously? I’m betting it was so that others down the dissemination chain could see the names of Trump associates — names the investigating agencies that originally collected the information had determined not to unmask. Third, and finally, let’s consider the dissemination chain Rice had in mind. Put this in context: Farkas had left the Obama administration in 2015, subsequently joining the presidential campaign of, yes, Hillary Clinton — Trump’s opponent. She told MSNBC that she had been encouraging her former Obama-administration colleagues and members of Congress to seek “as much information as you can” from the intelligence community. 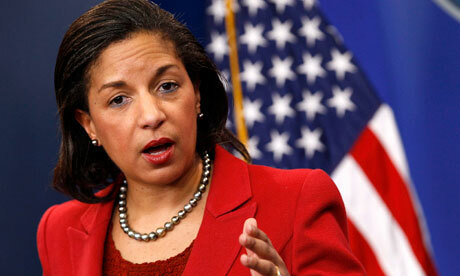 To summarize: At a high level, officials like Susan Rice had names unmasked that would not ordinarily be unmasked. That information was then being pushed widely throughout the intelligence community in unmasked form . . . particularly after Obama, toward the end of his presidency, suddenly — and seemingly apropos of nothing — changed the rules so that all of the intelligence agencies (not just the collecting agencies) could have access to raw intelligence information. As we know, the community of intelligence agencies leaks like a sieve, and the more access there is to juicy information, the more leaks there are. Meanwhile, former Obama officials and Clinton-campaign advisers, like Farkas, were pushing to get the information transferred from the intelligence community to members of Congress, geometrically increasing the likelihood of intelligence leaks. By the way, have you noticed that there have been lots of intelligence leaks in the press? There’s an old saying in the criminal law: The best evidence of a conspiracy is success. The criminal law also has another good rule of thumb: Consciousness of guilt is best proved by false exculpatory statements. That’s a genre in which Susan Rice has rich experience. Two weeks ago, she was asked in an interview about allegations by House Intelligence Committee Chairman Devin Nunes (R., Calif.) that the Obama administration had unmasked Trump-team members. Well, at least she didn’t blame it on a video.